FARNBOROUGH, United Kingdom. Officials at L3 technologies, Ultra Electronics Command & Sonar Systems, and Leonardo will collaborate to offer an antisubmarine warfare (ASW) acoustic system based on Leonardo’s new lightweight Ultra-LIght SonicS Enhanced System (ULISSES) processor. 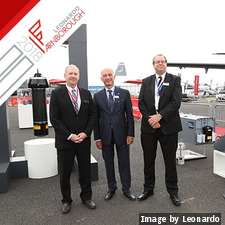 Under this collaboration, Leonardo will offer an integrated system comprising ULISSES and either a dipping sonar provided by L3 or sonobuoys provided by Ultra, or a combination of both. The integrated system will be trialed for the first time later this year with the complete system available for deliveries in 2020. Notably, the new system is able to deliver multistatic functionality, where the processor collects data from multiple sonobuoys and combines the information to develop an in-depth picture of the under-sea environment, including detailed location data of any potentially threatening vessels. Multistatic functionality invented and developed by Ultra is embedded in the ULISSES sonobuoy processor. The ULISSES system can also use the very-low-frequency L3 HELRAS dipping sonar as an active source, improving its multistatic performance and delivering the best-possible information to operators.